With today’s advances in dental technology, we at Cardiff Dental can offer a range of options to help create the smile of your dreams, whether your teeth are discoloured, crooked, too far apart, too short or too long, or too gummy. Our high-quality, safe and effective cosmetic dental procedures can dramatically improve the overall appearance of your smile. What are the available treatments for your smile? 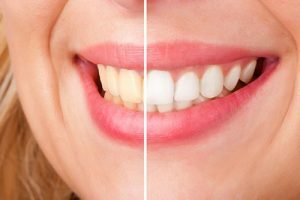 At Cardiff Dental, we offer both types of teeth whitening, and our experienced cosmetic dentist will help you choose the method that will help you to achieve the perfect shade of white you want. Composite fillings, also known as tooth coloured fillings, are used to repair a tooth that has been damaged due to decay, cracks, fractures and other factors. Composite fillings produce beautiful results. They are also a healthy way to repair and restore your teeth as the composite resin material strongly bonds with your teeth. Today, composite fillings can be used to fill cavities in any of your teeth. Porcelain veneers are ultra-thin shells made of tooth coloured materials designed to correct any of the problems mentioned above. They are bonded to the front surfaces of the teeth to improve their appearance as well as your smile. If you want to have a new smile or correct the flaws in your teeth, porcelain veneers may be the right treatment for you. If you are not comfortable wearing metal braces or want a discreet solution for your imperfect smile, then Invisalign could be the answer to your worries. Clear aligners such as Invisalign can straighten your teeth without the need for metal braces. Because it’s comfortable and removable, many teens and adults choose Invisalign as an alternative orthodontic treatment. At Cardiff Dental, you are just one step away from the smile you have always wanted – straight teeth, healthier, and giving you confidence. We will provide you with a fully detailed plan of your treatment options, costs and durations. Contact us on (02) 4954 6888 today! At Cardiff Dental in Cardiff, our goal is to make quality dental care affordable. We encourage you to take advantage of our latest offers. To find out more, visit our special offers page or contact us now on (02) 4954 6888 or make an appointment online.